Do you often find yourself losing grip on your discs when playing in humid, wet, or cold weather conditions? 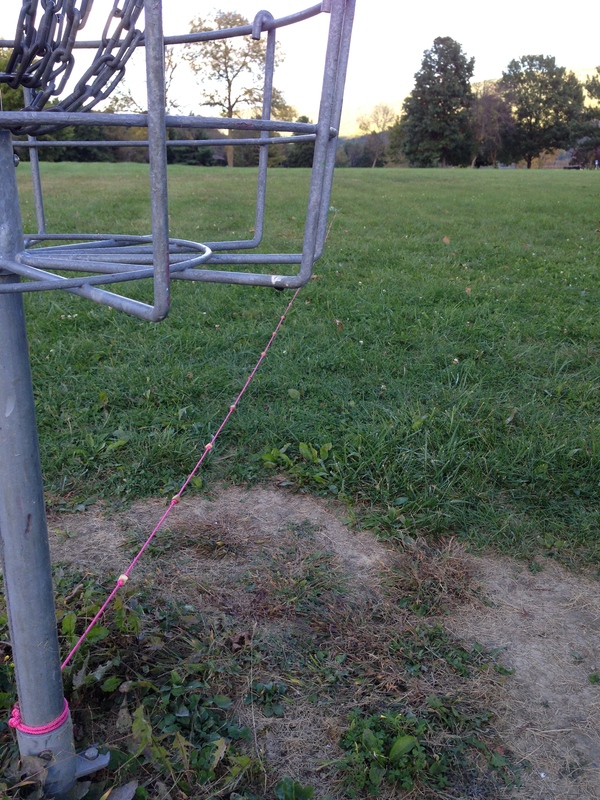 To me, there’s nothing more frustrating than having your fingers prematurely slip off a disc sending your disc careening into the treeline at a mere 50 feet from the teepad. Humid weather is very common here in the Georgia summers. If you’re like me, my hands tend to sweat a lot during summer rounds. Yes, towels and birdie bags help to a degree, but they can become cumbersome having to wipe down discs or drying off my hands after each throw. Lately, we have also had lots of rain in the past month or two—a lot more than I remember in quite some time. We all know how bad your barehanded grip can be when the ground and your discs are wet. But does wet weather deter you away from the disc golf course during those weeks where it seems to rain every day? I hope your answer is “no.” I would like to think that you’re a dedicated enough of a player that you wouldn’t let any inclement weather get in your way—that is, assuming it’s safe weather. But what if there was a possible solution to helping with your grip? I’m sure I’m not the only one, but I don’t have the best circulation in my fingers and toes. This makes playing in frigid temps all the more difficult and uncomfortable when you can barely feel your fingers. Hand warmers and wearing gloves in between throws help to a degree, but when your bare fingers hit that air… yea, you know that feeling. Over the years I have looked for some sort of “throwing” glove that had decent grip on it as well as to keep my hand warm during winter rounds. The gloves I’d come across were either too bulky or had so much grip that I ended up griplocking the heck out of the disc. Regardless of the glove type, the gloves were still too thick. I was missing that feeling, that connection, of disc to my fingers—that grip of confidence. Now fast forward to the last tournament I played in back in November. It was a cold, damp morning with temps in the upper 30s for the first round. My fingers were freezing! When my fingers are cold, I can forget having any kind of reliable grip to the disc. I made the lead card in my division for second round. I got paired with a few guys that were wearing these black gloves. I didn’t think much of it at first, because “Hey it’s freakin’ cold and lots of players here are bundled up in beanies and gloves, etc.”. But later in the round I noticed that three of the guys all had on what appeared to be the same brand of black gloves with an iconic yellow emblem. Ok now that observation piqued my interest, so I had to ask what they were. “Friction Gloves”, they said. That was the first I had heard of them. They swore by them and kept talking about how much they enjoyed the gloves and what an improvement they felt that gloves had made to their throwing. One of the guys offered to let me try the other glove. While I had struggled with keeping my drives in the fairway at the start of this round, I couldn’t chance trying out something new and different on my hands. My first thought was these things have got to affect my release. What if they were too grippy and I griplocked? I can’t afford for that to happen now, not on lead card, I told myself. 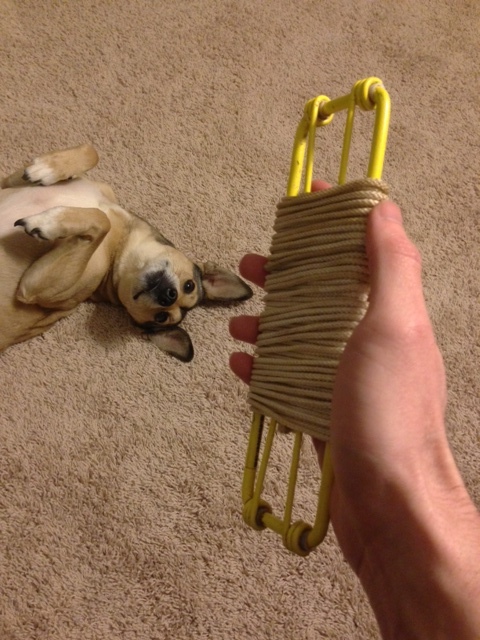 He did admit that it took him a few throws to get used to them, but they were awesome. Ok so yea, I really wanted to try it but after the tournament. I found him after the tournament and congratulated him on his 1st Place finish. He still spoke highly of the gloves and asked me if I wanted to try them. I took him up on the offer and did maybe 10-15 test throws in the field nearby. Still cold out and my arm was already pretty sore from throwing two rounds, but I still gave it a shot. It took me about 3 throws to get the right feel for them, but I was actually getting a bit more distance after several more throws than I had thrown all day! And this was after 36 holes. Hear me though, I’m not saying these gloves are going to give you more distance. I’m saying that these gloves can improve your grip during unfavorable playing conditions. Playing in the dead of summer and your hands are sweaty? Try a Friction DG Glove. Playing an early morning round with dew on the ground? Try a Friction DG Glove. Playing in frigid temperatures and can’t feel your fingers? Try a Friction DG Glove (or better yet the Friction Warm version). These gloves are allowed in PDGA play. Comes in Men’s and Women’s sizes. Available in Left- and Right-handed models. Very thin, somewhat breathable material. They are not tacky. A subtle grip that made a big difference to me. Don’t just take my word for it though, give Friction Gloves a try. I would love to hear from you guy’s if/when you use them and what you think. Keep Your Score with ScoreBand! 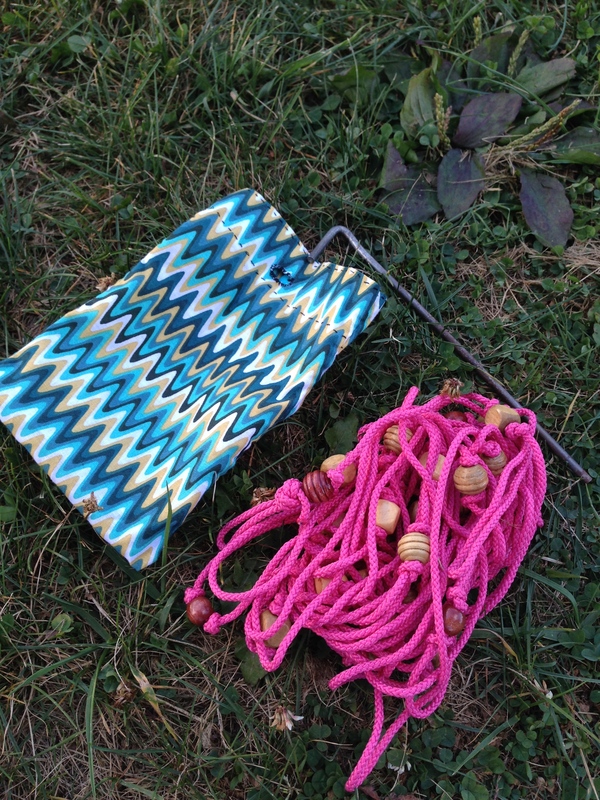 What do you keep track of your disc golf scores with? Do you find yourself fumbling through your disc golf bag in search for that dang pencil or constantly pulling out your smartphone after each hole to keep track of your scores? Well what if I told you that there is a much easier, and simpler way to keep up with your scores? There is, and I was fortunate enough to come across it via Women’s Pro Disc Golfer/Model Holly Finley on Twitter. It’s called the ScoreBand®. The ScoreBand® is a slick, portable, and convenient silicone wristband that allows you to track your scores in three different modes! Not only is it a watch too, ScoreBand® has a Tennis mode, Golf mode and an All Score mode. Since I’m a disc golfer, this review will mostly go in-depth about the Golf mode because it closest relates to our sport. The ScoreBand® is sweat & water-resistant and made of a grippy, non-slip silicone material. Normally I’m not one to wear things upon my wrists while playing because my mindset is that I feel like they mess me up. =) But this on the other hand, is very comfortable and does not slide up and down when I throw. It has a very slim, modern design to it which I find pretty cool and stylish. It comes in two band colors (black and white) and has four button colors (green, orange, pink and grey) available to choose from—making 8 different possible color combinations. Each wristband is available in four size options from Small to X-Large as well. Ok, the ScoreBand® is very easy to use. No fancy screens. No unnecessary buttons. No wacky user interface. It’s simple. It’s functional. That’s all we’re looking for here. Great for the active person that just wants a solution to quickly track scores in a convenient manner. On the wristband, you simply have two buttons on the face—an up and a down arrow. This is how you’ll enter your scores. First, let’s get to the mode that we’re going to use. By default, the Time (watch) mode is displayed first. To toggle through the other modes, press the silver button on the right side. 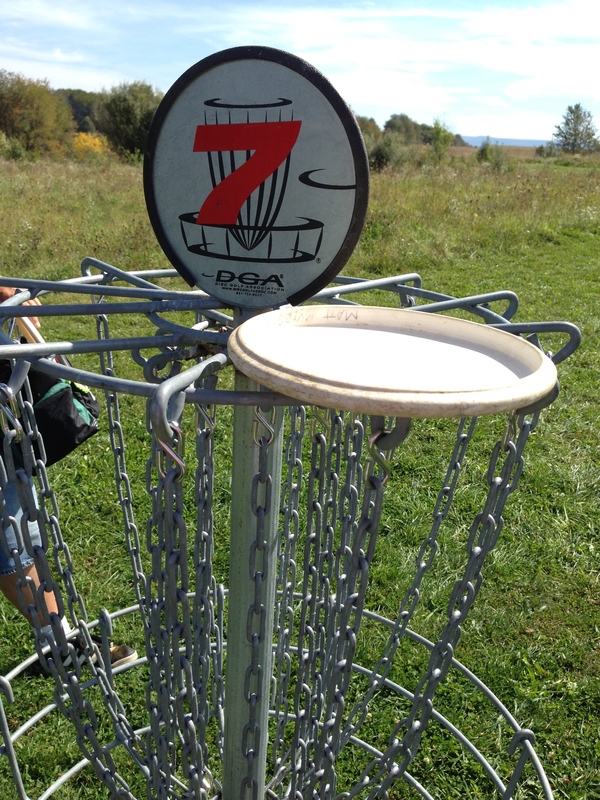 If you’re a disc golfer, use the Golf mode. You know you’re in Golf mode setting when you see the small “G” in the center of the screen. You’ll use the up and down arrows to your record your throws for each hole. The top digit is your hole score while the bottom digit is your round score. 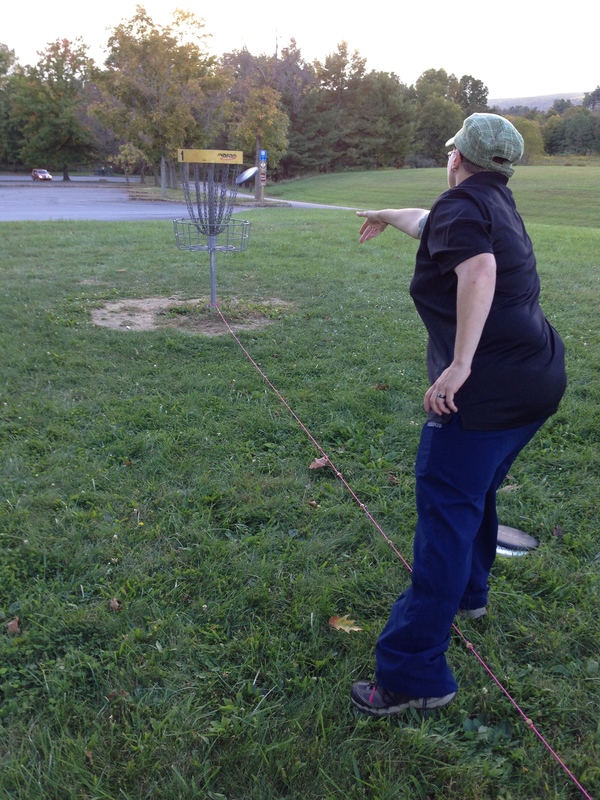 For example, you make it in the basket in 3 throws on the first hole. You would tap the up arrow 3x until “3” is displayed. Now that your number of strokes is displayed on top, next hold down the down arrow for 3 seconds to “enter” that score. The entered score “3” will now show in the bottom spot as your total round score. Then say you get a “4” on Hole 2. Arrow up 4x, hold the down arrow for the 3 seconds to enter that score and you’ll notice the bottom number then changes to “7”. You get the point, right? Easy! If you go past your number while arrowing up, just tap the down arrow to count back down. And what I like about this, is how easy it is to hit the buttons. You can still be walking & talking and not really have to pay attention to entering in the numbers—unlike trying to track it on a cellphone when you have to make sure you’re on the correct screen. You’ll be at the next teepad in no time while you’re buddy’s back there fiddling with his smartphone score tracking app. This is great for the social disc golfer. The All Score mode can be used to your advantage if you would like to track more statistics. Try using it in tandem with the Golf mode while you’re playing to record things such as fairways hit or putts made. Toggling between different modes does not erase or interfere with the scorekeeping. I know fairways in disc golf are a little different than ball golf, but you might be interested in keeping track with how many of your drives land in the “fairway” when you play. Think about it, have you ever really thought about what your driving accuracy was when playing? Maybe you record how many putts it took you total in a round. For those that want to increase their putting accuracy, try using the All Score mode to tally those. You could even use the All Score mode to track your Birdies in a round. Another option would be to track a friend’s score using it while you use the Golf Mode. There’s numerous possibilities here, use it to your advantage my friend. I have thoroughly enjoyed the month and a half of testing I’ve put the ScoreBand® through. With its stylish, slick appearance, I wear it as my everyday watch. It’s extremely lightweight and I forget it’s even on my wrist sometimes. When playing disc golf with it, I never have to worry about not keeping a round score because my cellphone battery is low. Don’t get me wrong, I would never give up some of my smartphone scoring apps. Because there definitely are times that I like to track lots of my stats and/or post them to social media. But like I said earlier, it’s great for people that are looking for a simple, easy way to track score without the hassle of smartphone scoring apps and keeping up with score pencils. It would make a great gift for a child too to keep score while they’re playing. If there’s one thing I would change about the ScoreBand®, is that I wish it would indicate the hole number you’re on. On a few occasions my first day testing it, I couldn’t remember if I’d recorded the hole or not. But I did hear that that feature is coming. I also read where they had custom logo printing available on the bands, sweet! All in all, if you’re looking for a stylish, lightweight wristband watch for yourself or an athlete in your family, I would recommend looking further into the ScoreBand®. They retail for around $24.99 and can be found in Golfsmith stores, Brookstone and several other stores listed on their website www.ScoreBand.net. The ScoreBand® even won the “Best Product Concept Award” at the 2012 PGA Merchandise Show. +Read more about ScoreBand on their website, www.ScoreBand.net. +Follow ScoreBand on Twitter @TeamScoreBand.